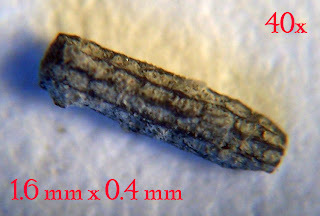 My search for Ordovician Period microfossils led me to this little jewel. It appears to be the spine of an echinoid. 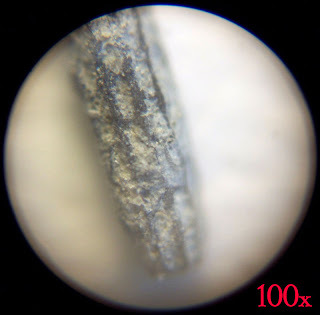 The tube size is about 0.4 mm in diameter and 1.6 mm in length. The pores filled with a gray matrix are elliptical in shape and length wise rows that cover the cylindrical shape. If the pores were more round I might guess this is some sort of byrozoan. 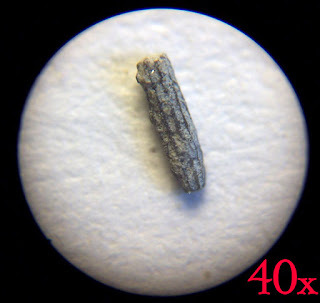 Echinoids existed in the Ordovician Period but I do not have an identification for this fossil. Of course, I am just speculating this is what it is based on Jurassic spines I have seen. The microscope is opening up another world of Kentucky fossils. This fossil was found in Bullitt County, Kentucky and might be the Grant Lake Formation.